The 2nd image shows the new item in the list, the alliance field points to the Alliances term set. In this 3rd image, I've entered the term coming from the 'Industries' term store. It did "validate" by the red colored text font. but when you press the save, it saves successfully. I believe this shouldn't be the case and I'm not sure as to why this is the behavior and if this is indeed a known bug for managed metadata. Let me know if you need more information. Appreciate all the help I can get! probably moot at this point but for anyone who comes across this, "Alliances" above is not a term set. 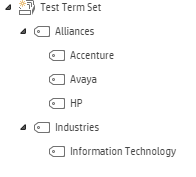 "Information Technology" is part of the same term set as Alliances ("Test Term Set"). Not the answer you're looking for? Browse other questions tagged 2013 sharepoint-server managed-metadata or ask your own question.